"NB: We are now on the silver ink edition, but all our copies are still signed and sketched in." 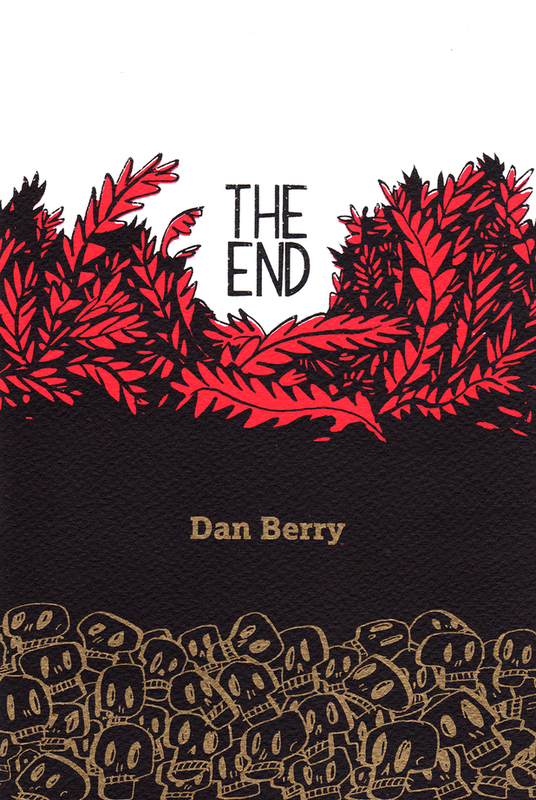 Bound within a luxurious, rough-grained, card-stock cover which had been screen-printed with scarlet, black and silver ink are some of the most sobering pages I've read from Dan Berry. Such is the beauty of the cover you might not register at first that the objects which the gold adorns are skulls. It's closer to CARRY ME in tone that the comedy of CAT ISLAND, THE SUITCASE, HEY YOU! and THROW YOUR KEYS AWAY, but in execution it's yet another departure. The washes are in a wet, inky black and blue whose sheen is picked up beautifully on the crisp, white, satin paper. A lot of this takes place at night, which doesn't always bring out the best in us. We don't like it when we can't see what is happening. We don't like it when we don't understand what is happening. We don't react well to that which we cannot control. Time in particular we feel the need to control: we measure it out in years divided into months or weeks, which we decided should have seven days composed of twenty-four hours each housing sixty minutes and they, sixty seconds. A day makes solar sense, as does a year, but boy we don't half attach a lot of importance to some of the more arbitrary measurements and a countdown sure gets the adrenalin rushing. When the numbers first appeared overnight - all of them "14" - they did so on walls and billboards and buses: the sort of places you'd expect from a marketing campaign. So we shrugged because that's what we assumed it was. "Thirteen came and went the next day with a chorus of "I told you so" and eye-rolling from the people who kept up with this sort of thing. The progression from 14 to 13 was predictable and had been done to death, they said. If this was to be a truly effective ad campaign, we'd need to given a reason to car and we didn't have that. 6 /10, must try harder." 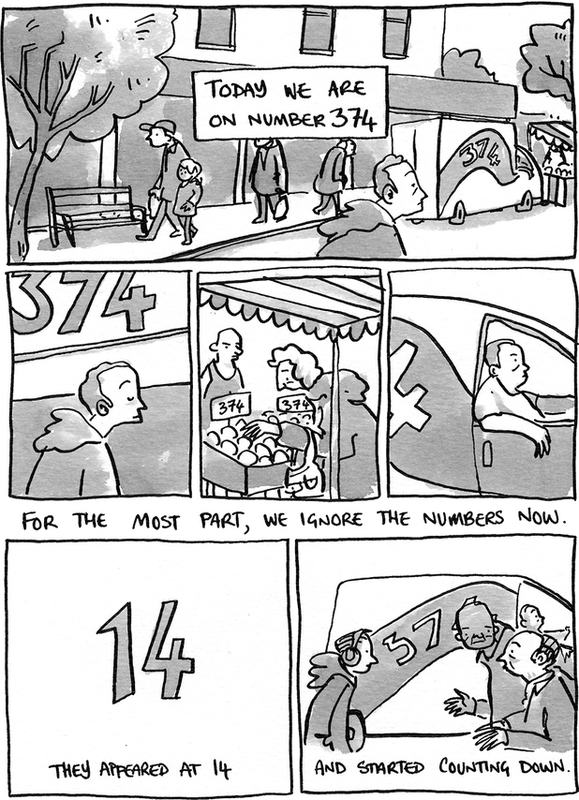 Dan's put an enormous amount of lateral thought into this, a study in human behaviour under unusual circumstances extrapolated from how we do react to numbers and time. 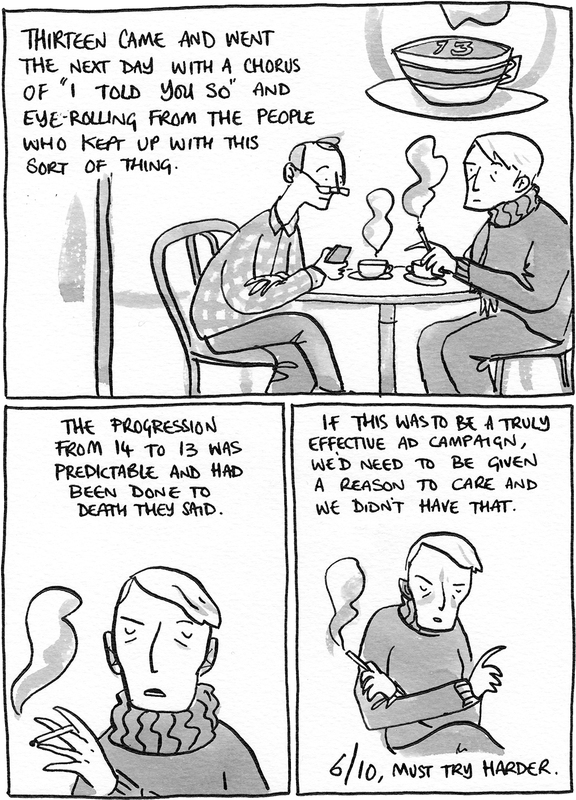 Also, I love the core conceit and where Dan ran with it right to the end.